You can create affiliate banner image ads using any dimension you prefer. However, it is better to use the popular image ad dimensions when creating the banner ads for your affiliates. This will help your affiliates when they go to embed the banner ad on their sites. You don’t necessarily have to offer banner ads in all dimensions. Just having a few is good enough. You can also just offer the banner image files (in various dimensions) on your website somewhere. So your affiliates can download the images, then use the one they want to create the affiliate referral link. 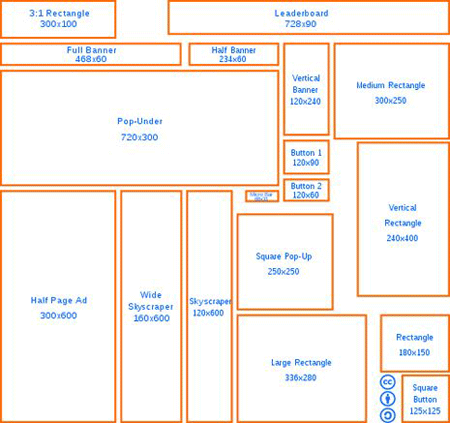 The following two dimensions are probably the most widely used image banner ad size. These sizes fit in the sidebar of a site really easily. You can re-size your images (that will be used for ads) using a photo editing software then upload them to your site.